2. 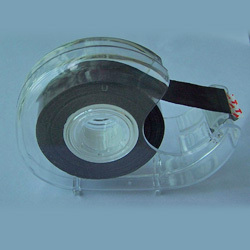 Magnetic adhesive tape, a roll of dark brown magnetic tape in a handy dispenser with a tear-off bar. Rip off a strip of tape, stick the sticky side to a photo, art project, or note and the magnetic side will hold it on a refrigerator door, file cabinet, or any other steel surface. Light duty, like all fridge magnets, so stick to notes and pix and other fluff, which can be repeated use, without leaving any traces. Size: 19mm x 3M, 19mm x 5M, 19mm x 8M, etc.